These accounts are dramatizations of actual stories with the real names slightly changed, at least in the last two stories about the six kamikaze pilots who made forced landings in the sea near Kuroshima, a small island about 60 kilometers southwest of the southern coast of Kagoshima Prefecture. 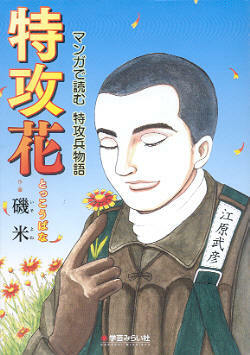 Yone Iso, a female manga artist, portrays the kamikaze pilots as young men who joined the Special Attack Corps for the people they loved and for their country. The stories focus on the pilots' interactions with the civilian population with only one brief battle scene when a special attack squadron is ambushed by American fighters near Amami Ōshima on the way to Okinawa. The first story depicts the kindnesses showed by Navy pilot Yasuhiko Mebaru to a 15-year-old girl named Katsuko Adachi. Mebaru does not return from his special attack sortie. At the end, an elderly Katsuko goes by ferry to Okinawa with her older sister who also knew Mebaru, and she throws a bouquet of tokkōbana (kamikaze flowers) into the sea in his memory. The story is based on part of Yoshiko Tanaka's book entitled Jūyonsai no natsu: Tokkōtaiin no saiki no hibi o mitsumeta watashi (Summer when 14 years old: I looked at days of kamikaze pilots' end). "Satsuma Fuji" refers to Mt. Kaimon at the end of the Satsuma Peninsula. People often refer to it as "Satsuma Fuji" with a shape similar to Mt. Fuji, and kamikaze pilots' last view of the mainland when going south toward Okinawa was Mt. Kaimon. This second story involves two friends, Kōji Manda and Teruto Ōki, who grew up near Mt. Kaimon and became members of the same special attack squadron (tokkōtai) at Chiran Army Air Base. Manda clearly has qualms about making a suicide attack, but he tells the commander almost unthinkingly that he wants to join a special attack squadron. They together go to visit Toyoya Restaurant in Chiran where the owner comforts them. This scene is reminiscent of the support provided by Tome Torihama, owner of Tomiya Restaurant in Chiran. The special attack squadron takes off from Chiran but encounters American P-51 Mustang fighters on the way to Okinawa. 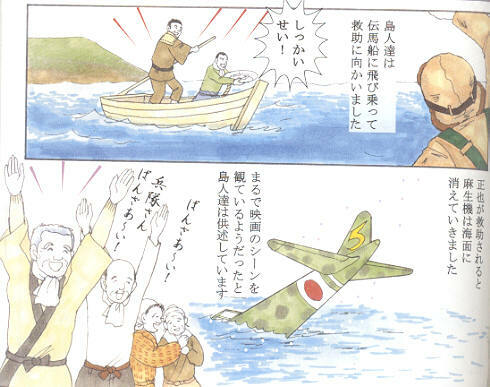 Manda's plane gets shot down, but he survives when he makes a forced landing in the water and gets rescued by a Japanese Army boat from a nearby island. At the end, as he looks upon Mt. Kaimon, Manda remembers Ōki and others who gave their lives in special attacks. The third story tells how Army pilot Masaya Asao (Masaya Abe in history) delivered medicine to seriously burned Navy pilot Ensign Shibasaki (Ensign Shinya Shibata in history) on the small island of Kuroshima. On April 29, 1945, Asao and seven other members of the 24th Shinbu Special Attack Squadron made a sortie from Chiran Air Base. Asao's plane engine developed problems, and he made a forced landing in the sea near Kuroshima. He was rescued by the islanders and found out that Ensign Shibasaki of the 29th Shinbu Special Attack Squadron had crash landed in the sea there after taking off from Chiran three weeks before on April 8, 1945. A young islander named Katsumi Yasukata (Katsumi Yasunaga in history) volunteered to go with Asao back to the mainland in a small boat. They reached land after 30 hours of rowing. In early May, Asao made another sortie to make a special attack, and on the way to Okinawa he dropped from his plane a package with medicine for Shibasaki and other supplies for the islanders. The fourth story is about Navy airman Takehiko Ehara (Takehiko Ena in history) and his relationship to Kuroshima. On May 11, 1945, Ehara made a sortie from Kushira Air Base in the 3rd Seiki Special Attack Squadron as navigator in a three-man Type 97 Carrier Attack Bomber (Allied code name of Kate). His plane had to make a forced landing in the sea, and all three of the crewmembers survived by swimming about a kilometer from the crashed plane to the shore of Kuroshima. On July 30, 1945, a small Army transport submarine picked up the stranded airmen to return them from Kuroshima to the mainland. When he returned home after the war's end, Ehara's family had already received money from the government and notification of his promotion of two ranks for his death in a special attack. At the end, an elderly Ehara talks to reporters on Kuroshima next to the Special Attack Peace Kannon that he erected to remember the young men who died in special attacks during the Battle of Okinawa and the kind treatment provided during the war by residents of Kuroshima to the kamikaze pilots who were stranded there.